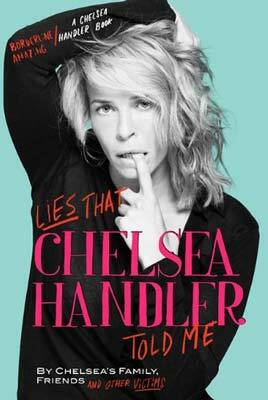 Lies that Chelsea Handler Told Me , by Chelsea’s Family, Friends and Other Victims and Chelsea Handler. Publisher: Grand Central Publishing; First Edition first Printing edition (May 10, 2011). Humor. Hardcover, 304 pages. The takeaway from Lies that Chelsea Handler Told Me: Chelsea’s a prankster and a loyal friend. I’m a fan of Chelsea Handler the comedienne and talk show host but haven’t particularly enjoyed her books. They’re not as clever and witty as I expected. My Horizontal Life is a good, light read but I anticipated more and the same with her others—Are you there Vodka? It’s Me Chelsea and Chelsea Chelsea Bang Bang [that one I thought was the worst]. This time around, Chelsea decided to let her friends, family and staff write about her and her penchant for telling lies and playing elaborate jokes on people. This allows the reader to know some more intimate details about Chelsea’s supportive nature: she’s worked with many of the same people for years; she takes group vacations to Cabo and the Bahamas; and she bought a spacious house so her brother Roy and other friends could move in or visit. Chelsea Lately show producer Johnny Kansas [whom Chelsea calls “the bird”] writes that Chelsea hid two turkey meatballs in the backseat pockets of his new Cadillac. Chelsea’s diet consists of a lot of turkey meatballs, humus and arugula. During his honeymoon, Chelsea really nailed writer Brad Wallack by convincing him that TIME planned to visit the show to do a photo-shoot with the writers. Brad felt he’d worked hard and deserved the credit but he’d have to cut his honeymoon short to return to New York. He went as far as spending an exorbitant fee to change the tickets before he found out that it was a prank. Chelsea told staffer Heather McDonald she was pregnant and Heather obsessed over it for nearly a week. Roundtable regular and stand-up comedian Josh Wolf got duped into thinking his wife owed $5000 to bookies for a gambling debt. CHELSEA CHELSEA BANG BANG by Chelsea Handler. Publisher: Grand Central Publishing (March 9, 2010). 256 pg. I wasn’t joking but I quickly lost interest in the conversation due to the fact that despite my having spoken to Lydia at great length about misplaced enthusiasm, she insisted on using exclamation points in lieu of periods and continued pairing them with my least favorite invention, LOL. You wouldn’t say LOL if you were out to lunch with someone, why would you write it in an instant message or an e-mail? Chelsea Handler gets a book deal for unfunny, contrived CHELSEA CHELSEA BANG BANG & I get nil published? Oh, I’m not jealous or anything. And if you believe that, I heard the Brooklyn Bridge is for sale. I find Chelsea Handler to be entertaining on her show Chelsea Lately. Her writing has not impressed me [My Horizontal Life, Are you there Vodka? It’s Me Chelsea]. I expect her stories to be racier, funnier, more adventurous or perhaps more introspective. In CHELSEA CHELSEA BANG BANG, I have a difficult time believing that what she’s writing about actually happened. When her “silver fox” partner Ted, the head of E! Entertainment, wants a fish tank, Chelsea insists on buying a dolphin for the tank. That’s when I just thought she can’t be serious and could this really be true? I know this woman barely graduated high school but she has enough life experience to know that owning a dolphin is just cruel, ridiculous and impossible. The conversations and events she recalls seem as scripted as the silly skits on her show [my least favorite part and thank you TiVo that I don’t have to suffer through them]. Throughout most of CHELSEA CHELSEA BANG BANG , Handler retells stories from her show Chelsea Lately: Ted’s penchant for snorkeling; how she makes fun of him and plays practical jokes on him; her proclivity toward “chunky” or real big people and little people with a little extra to grab, like her chauffeur Sylvan, Ted, and her “assistant” Chuy; also Chelsea’s preference to take others on vacation to her partner’s dismay. One story Chelsea already told in detail on the show, when she brought Sylvan along on an island vacation to try to get him some “action.” Chaos ensues Chelsea Handler-style. Right off in CHELSEA CHELSEA BANG BANG, Chelsea talks about discovering masturbation . [I would get so excited on Friday nights, knowing that my peekachu and I would be able to have the whole weekend to ourselves.] and then how her parents were so mean and out of touch that they didn’t buy her a Cabbage Patch Kid [I knew that my parents would never fall for what was “hot” on the market. The word “hot” wasn’t even in their stream of consciousness.] Chelsea discusses her sisters and brothers but doesn’t particularly delve into anything substantial. My major gripe with Handler’s writing is that she should either be completely jokey or actually reveal something behind that façade she constantly maintains. My favorite aspect of Chelsea Handler is the spontaneous, off-the-cuff Chelsea–although perhaps her writers even script what I think is unscripted. Perhaps that’s why I find her antics and writing rather pedantic. CHELSEA CHELSEA BANG BANG will of course earn her a spot on the NYT’s Best-Seller list. I admit that I am NOT okay with that. Bitter pills. Chelsea Handler will be signing copies of CHELSEA CHELSEA BANG BANG at my favorite bookstore– Brookline Booksmith on April 10.